Silver Trident - Double Serration - Box. 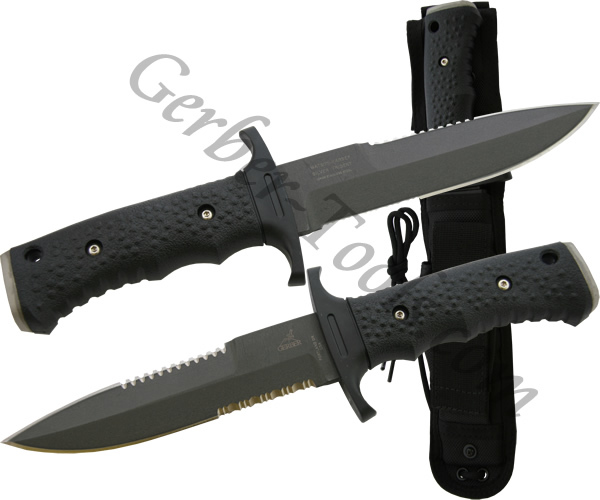 The Gerber Silver Trident model 06995 has double serrations on its dagger-like blade. The blade is made of 154 stainless steel with a hardness rating of HRC 59-61. The handle is built of a special material called Hytrel. Hytrel is resistant against ultraviolet rays, heat, and corrosion. The knife is so tough that you can hammer a nail into wood with the flat end of its handle. A ballistic nylon sheath is included so that you can mount the Gerber Silver Trident on your leg, arm, flack jacket, or anywhere you wear a strap.